Millions of Muslims all over the world are giving their lives to Jesus Christ, and in many instances this is happening because of dreams, visions and other supernatural encounters. Recently I have been writing a lot about the decline of Christianity in America and about the judgment that is about to hit our churches. Fortunately, the decaying state of the church in the United States is only a small part of the overall story. In other areas of the globe, Christianity is experiencing absolutely explosive growth even in the midst of horrendous persecution. This is particularly true in Islamic nations, where we are seeing things happen that could have come straight out of the Book of Acts. All over the planet, Jesus is personally visiting Muslims in supernatural ways, and this has resulted in an enormous wave of conversions. Abu Radwan enters a church on the outskirts of Beirut with his wife and two kids. His wife removes the black headscarf covering her hair. It was here, a year and a half ago, that they converted to Christianity. "Of course it was a difficult decision," Abu Radwan says. "I was born into a Muslim family." The family is from the city of Homs in Syria. They sought refuge in Lebanon at the beginning of the war. Then two years ago, Abu Radwan says Jesus appeared to him in a dream. "I started going to the church," he says. "I believed that Jesus was coming to help us, to save us." When it comes to supernatural encounters, there is literally nobody that is out of the reach of the Lord Jesus. "He told this YWAM leader that he had begun having dreams of this man in white who came to him and said, 'You are killing my people.' And he started to feel really sick and uneasy about what he was doing," Fadely continued. The Christian was killed and this ISIS fighter actually took the Bible and began to read it. In another dream, Jesus asked him to follow him and he was now asking to become a follower of Christ and to be discipled." 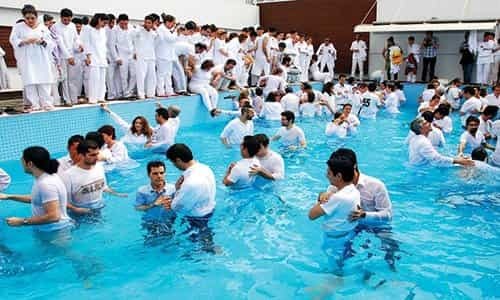 As Faithwire noted back in November, an Iranian Christian pastor claimed at the time that there's a stunning revival underway in his country, where he says the number of Christian adherents has increased from 100,000 in 1994 to 3 million today. Some claim that Jesus has been appearing in dreams and that those visions have helped spark the conversions. In the western world, there seems to be a great misconception that there are hundreds of millions of people in the Islamic world that are "out of the reach of the gospel". But this has never been the case, because with God all things are possible. Just look at the wonderful revival that is going on in Bangladesh. Officially, 89 percent of the population of Bangladesh is Muslim, about 10 percent are Hindus, and less than one percent is Christian. Pastor Khaleque, 60, a former Muslim and now a Christian street pastor who works among the hill tribes, in the northeast part of Bangladesh, told CFI, "In the last 12 months, more than 20,000 Muslims have converted to Christianity. More than 20,000 have converted, and this is becoming a real problem for the Muslims." Perhaps we are just way too comfortable in the western world. We don't have to pay much of a price for our faith, and so most people don't seem to take it very seriously. On the other side of the world, standing up for your faith can literally cost you your life. A Christian woman's fateful and defiant stance in front of a bulldozer last week evoked the memory of Tiananmen Square and has become a rallying cry against persecution at the hands of the Beijing government. The woman, identified by Christian activists as Ding Cuimei, wife of the Rev. Li Jiangong, was trying to stop the government-ordered demolition of Beitou Church in the central Hena province city of Zhumadian. Unlike the iconic man who brazenly stopped a tank in the 1989 uprising, Ding was pushed into a ditch and buried alive as horrified congregants watched helplessly. Would you be willing to stand in front of a bulldozer and face potential death for what you believe? You don't have to be the richest, or the smartest or the best looking to be used by God. You just have to be willing to be totally sold out for Him. In the western world we are drowning in money and resources, and there are church buildings all over the place, and yet the United States, Canada and Europe are all becoming "post-Christian societies". But elsewhere we are witnessing an explosion of the faith that is absolutely unprecedented. For instance, in 1900, there were approximately 10 million Christians in Africa. By 2000, there were 360 million. By 2025, conservative estimates see that number rising to 633 million. Those same estimates put the number of Christians in Latin America in 2025 at 640 million and in Asia at 460 million. I believe that a great move of God is coming to the western world too, but a great shaking is going to have to come first. Hearts have grown so hard and so prideful that it is going to take a great humbling before most people understand that they need the Lord. So even though the shaking will be very challenging, we should welcome it, because it will shake multitudes into the Kingdom of God.